For St. Patrick's Day, of course! St. Patrick’s Day is on March 17th which is now just two weeks away. If you are looking for a low key, and easy way to celebrate, I have the perfect sweet treat snack for you. 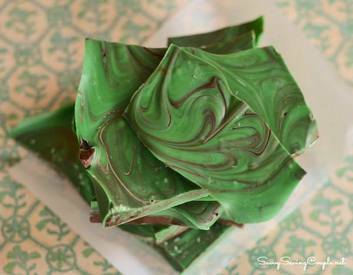 How about some marbleized green and chocolate bark? It literally takes maybe 5 minutes to make, and is so delicious! My kids helped me make the swirls, and after 30 minutes, it was ready to break apart and eat! The best part is our St. Patrick’s Day Chocolate Bark - its just two simple ingredients!